Who were the individual award winners at 2018 World Cup? 16 Jul 2018: Who were the individual award winners at 2018 World Cup? After 32 days of action, the 2018 World Cup came to an end on Sunday with France being crowned champions of the world. There were several exceptional performances in this tournament, but some players stood out from the rest. Here we take a look at the winners of the individual awards that were handed out at the conclusion of the 2018 edition. Croatia's captain Luka Modric was, undoubtedly, the best player in the tournament and rightfully won the Golden Ball award. Modric was the heart and soul of his national team, helping them reach the first final in their history. Belgium's Eden Hazard, who won several hearts with his dazzling performances, finished runner-up to Modric. 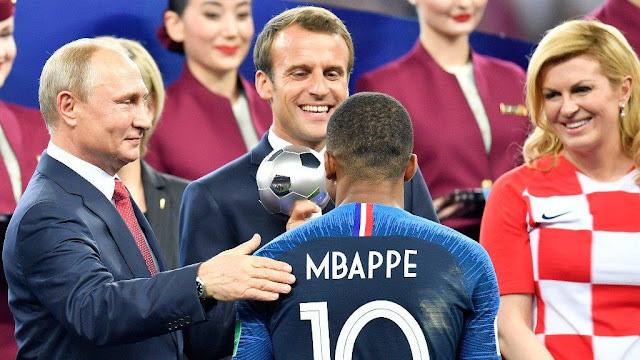 There was hardly any competition for this award as France's young striker Kylian Mbappe walked away with this prestigious honor. The 19-year-old was one of the stand-out performers at this World Cup, scoring four crucial goals for France including a goal in the final. Still just a teen, Mbappe definitely looks like he could lead France to more glory in the coming years. England might have been knocked out in the semi-final and also ended up losing the third-place match to Belgium, but they are still happy. Captain Harry Kane, who scored 6 goals, finished as the tournament's top goal scorer. Three of Kane's goals came from penalties but one can hardly argue with the Tottenham man who has the numbers under his belt. Courtois and Belgium had a fantastic run at the World Cup as they finished third, which is their best finish at the tournament. Courtois conceded just 6 goals and made some unbelievable saves especially in the knock-out against Brazil. The Chelsea custodian might have missed out on the World Cup but will be glad to take home the top honor for a goal-keeper.